This past Sunday we welcomed Adam and Ashley Brown with their daughter, Penelope Lynn, to our congregation. 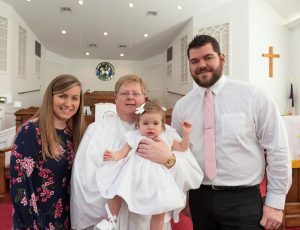 Penelope Lynn was also baptized by Pastor Matthew. The Diener assisting was Phyllis Conrad. Sign-up here for weekly emails from the pastor! Site content © 2018, Olivet Moravian Church. All rights reserved. Site photography belongs to the respective creators/owners and is used with permission. | Website designed by Andrew David Cox using Alone by Bearsthemes.